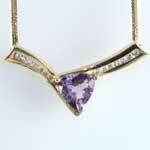 Simply lovely amethyst diamond pendant vintage necklace 14kt yellow gold. 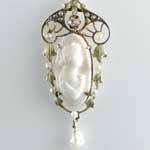 Antique carved shell ladies profile cameo diamond pendant with dangling pearl framed with yellow gold leaves. 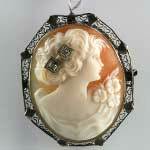 Exquisite antique diamond carved shell cameo brooch pendant with profile framed in white gold filigree. 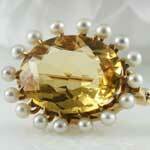 Antique over 8 carat bright yellow citrine and seed pearl 14kt brooch pin. 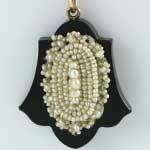 Antique Victorian black onyx seed pearl pendant. 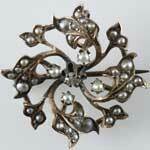 Antique seed pearl diamond pendant brooch in 18kt yellow gold. 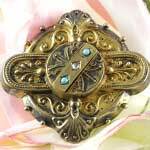 Antique Victorian turquoise diamond memorial hair brooch in yellow gold. 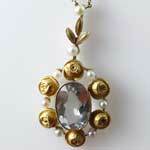 Estate aquamarine seed pearl necklace adorned with sculpted roses in yellow gold. 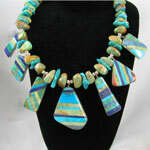 This beautiful turquoise necklace is reversible! 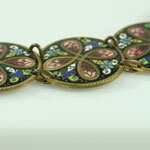 This unique necklace is a modern Squash Blossom Design, created by Native American Artist, Ronnie Aguilar. 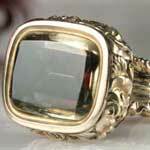 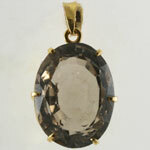 High karat yellow gold (22karat) enhances the beauty of this big smoky quartz in this estate pendant.